In Quebec, directly on the Ottawa River, sits the grand cedar structure of the Fairmont Le Château Montebello, a historic resort featuring buildings that date back to 1930. With over 10,000 red cedar logs used in the construction of the three main buildings, this resort contains the largest log cabin in the world. 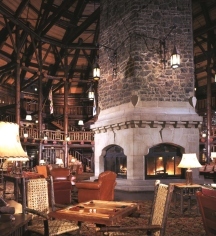 This log structure was originally used as the exclusive retreat of the Seigniory Club, which hosted the likes of Prince Rainier and Princess Grace of Monaco. In 1970, this relaxing escape to nature was opened to the public, after which it became one of the most popular luxury resorts in Quebec and Eastern Canada. The beautiful Fairmont Le Château Montebello features 211 luxury guestrooms on three floors. Each room is a welcoming retreat with an air of rustic elegance and warmth. On-property, guests can choose to be pampered in the spa and sauna, work out in the hotel's health club, or take a swim in the attractive indoor heated pool. Golf players will be pleased to know that the famously challenging course, designed by Stanley Thompson, is open seasonally. There are tennis courts indoors and outdoors, an arcade room, and marina on-site. For those wishing to hold a meeting or conference, there are more than 17 different meeting rooms, including the Golf Clubhouse. The resort is known for its gastronomy and guests can relax at the end of the day with a drink from Bar Le Foyer, or enjoy a full dinner experience at Aux Chantignoles, one of five restaurants on the grounds. Guests have an array of destinations to visit during their stay in Quebec and the outdoor adventures that await guests are seemingly endless. Fall and spring welcome activities like squash, tennis, biking, hiking, fishing, and indoor golf. Winter allows for even more recreational activities such as hockey, broomball, snowshoeing, snowmobiling, tobogganing, tube sliding, sleigh rides, ice skating, and dog sledding. Finally, summer is perfect for croquet, canoeing, swimming, volleyball, basketball, badminton, golf, and horseshoes. Surrounding the hotel, guests can explore the Rouge River, Plaisance Falls, Parc Omega, and Kenauk Nature Reserve to experience the natural beauty of the area. 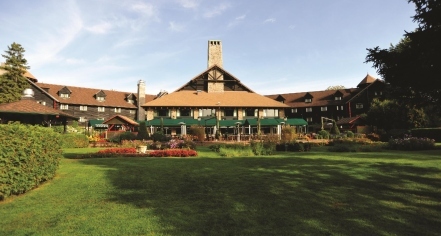 Fairmont Le Château Montebello, a member of Historic Hotels Worldwide since 2018, dates back to 1930. Fairmont Le Château Montebello was a private retreat for the elite Seigniory Club until 1970, when it was opened to the public as a resort. Extra Person Fees: A $40 per person, per night fee applies. Hotel/Resort Fees & Taxes: $28 plus taxes per room, per night. Parking: On-site parking is available on a complimentary basis, with valet parking available for a fee. Pet Policy: $45.00 CAD per pet, per day. Restrictions apply. In Quebec, directly on the Ottawa River, sits the grand cedar structure of the Fairmont Le Château Montebello, a historic resort featuring buildings that date back to 1930. With over 10,000 red cedar logs used in the construction of the three main buildings, this resort contains the largest log cabin in the world. Learn more about the History of Fairmont Le Château Montebello .